It’s 1949 Los Angeles, the city is run by gangsters and a malicious mobster, Mickey Cohen. Determined to end the corruption, John O’Mara assembles a team of cops, ready to take down the ruthless leader and restore peace to the city. Beautifully portrayed gangster film. The atmosphere of the 50’s radiates from start to finish in this film. 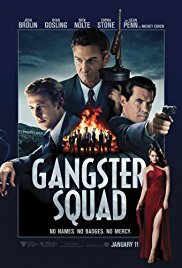 It’s not comparable to “The Godfather“, but it’s an entertaining action movie that can be quite brutal at certain times. I think Sean Penn is convincing in his role as Mickey Cohen and sometimes manages to be terribly frightening because of his expression in language and facial expression. Indeed he’s someone you rather not run into in a dark, abandoned alley. However, sometimes he looked like a cartoon character either because of the CGI or the make-up. Ditto for Emma Stone, a hot lady in an exciting red dress, who sometimes looked like Jessica Rabbit. Only downside for me (something that occurs in many films) is the fact that a gathered team of almost-super-heroes can embarrass a Mafia boss as notorious as Cohen, and dislocate his organization while a complete police force is being bribed by the same gangster. It always gives me such a “Oh come on ….” feeling.